How can a gas at such low concentrations create problems for living things? Try an experiment that will allow you to measure how many molecules you inhale with each breath. The volume of air you breathe is called your lung capacity, but you don’t always inhale and exhale the same way. There are three common measurements of lung capacity. Vital capacity measures the amount of air exhaled after taking a deep breath. The amount of air exhaled during normal breathing (regular amount of breathing while at rest) is called tidal volume. The amount of air left in the lungs while exhaling during normal breathing is called the expiratory reserve. After reading the set up and procedures below, decide which of the lung capacity measurements you would like to make at home with each of the members in your immediate family. Then design your techniques to make these measurements. You may also want to design experiments to see how exercise changes your breathing habits. Note of Caution: People with known asthma should not measure their vital capacity, and may not wish to participate in measuring tidal volume and expiratory reserve. Example of the calibrated jug. Complete these steps so materials are ready to take home. Create a chart for collecting data. Each person will repeat the lung capacity measurement three times in order to gather a representative measurement of their lung capacity. On paper, make a table with an adequate number of columns and rows to record each family member’s name, the three measurements, and the average of the three. You may also want to record additional information such as age, gender, body weight, height, sports played, if he or she smokes, or someone in their immediate family smokes. Create a scale for the plastic container. Fill the measuring cup or graduated cylinder with 200 ml of water at room temperature and carefully pour into the upright plastic jug/bottle. Mark the level of the water with the waterproof marker. 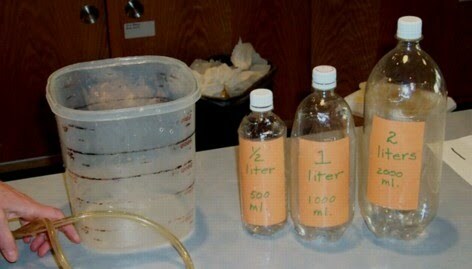 Continue filling jug with 200-ml increments and mark and label water levels. Interpolate and mark the halfway point between successive markings to identify 100-ml increments. Cap the container (some water may spill out, but try not to let any air bubbles into the container). Fill the large dishpan or sink with 10 cm to 15 cm of water. Invert container while holding the cap so the cap is pointing down. Place the capped end into the water and remove the cap. Check for excessive air bubbles inside the plastic container. You can rest the opening of the jug on the bottom of the dishpan for now, but don’t let the container fall over and air enter it. Place a student’s straw in one end of the rubber hose. When you are ready to make measurements, lift the opening of the jug off the floor of the dishpan and place about 10 cm of the strawless end of the rubber hose into the water and through the opening of the jug (see the figure below). Someone will need to hold the jug so it does not pinch the hose against the floor of the dishpan. The person holding the straw end will either need to keep the end of the hose with the straw above the top of the jug or pinch the hose shut until ready to begin blowing into the straw. Now you are ready to make measurements. Regardless of which of the three measurements you are making, hold your nose closed and exhale normally into the straw end of the hose. You should not hear any air leaking from the rubber hose-straw connection. Record the level of water remaining in the jug. Since the jug was filled from the bottom up, you are measuring the volume of air exhaled into the jug. This represents one measurement of your lung capacity. Refill the bottle for the next measurement. Share the data of your family with the class. Can you find patterns that influence people’s lung capacity? Does participation in aerobic sports increase one’s lung capacity? Does smoking affect lung capacity, even high school students? Does one’s height or body shape influence lung capacity? Does one’s age or gender influence lung capacity? Calculate the number of molecules you breathe in with each breath. This assumes that the amount inhaled is equal to the amount exhaled. Also assume body temperature (37ºC) and sea-level pressure (1 atmosphere) conditions. Hint: one liter of air at these conditions contains 2.37x1022 molecules. Next, calculate the number of ozone molecules you breathe depending on the air quality at the time. These numbers are important because 90% of the ozone breathed into the lungs is never exhaled since the molecules react quickly with the sensitive tissue of the lungs, nose, and throat. If the air contained 1 ppb (parts per billion) of ozone, how many ozone molecules would you breathe with each breath? What if it contained 10 ppb, which is regarded as the natural level of “clean air” prior to the age of industrial pollution? What if it contained 20 ppb, which is regarded as the current level of “clean air”? How many ozone molecules are inhaled when the air has an ozone concentration of 0.12 ppm (120 ppb), the average one-hour concentration defined by the EPA as unsafe for breathing? Based on your observations and calculations, discuss why children are so susceptible to health problems related to breathing ozone pollution. Consider the timing of smog events, when and where children play and their level of activity and body size/volume compared to adults. What is your rate of breathing? You may want to create an experiment to calculate how fast you breathe at rest and during and after exercising. Does exercising affect how deeply you inhale/exhale? Design an experiment to measure the changes in breathing patterns created by different exercises and by the amount of exercises. << Back to Ozone Chapter 11 - "Hazards of Ozone in the Troposphere"